Last week I tried to be a bad teacher. Now I’ve been a bad teacher before, so it’s not a stretch. Normally it’s not something I pre-plan- it just happens: mostly when I haven’t planned enough. 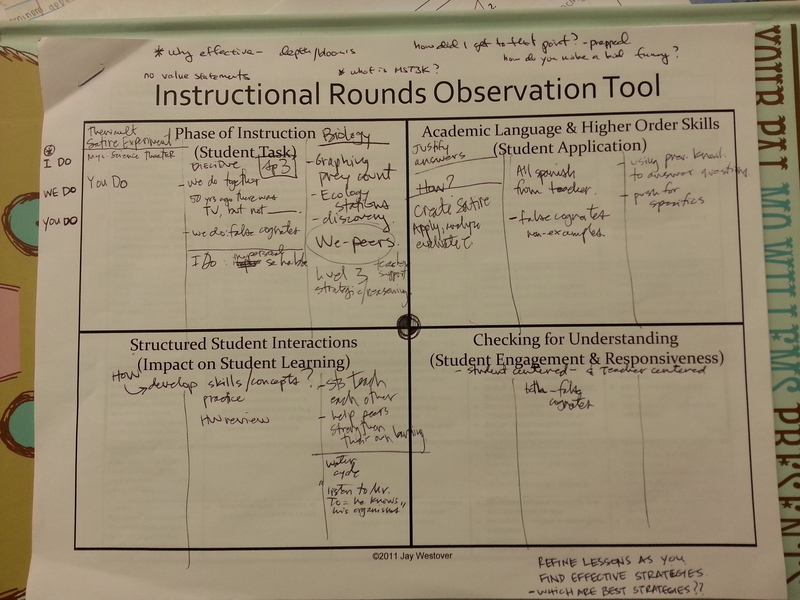 My school has been participating in Instructional Rounds for the last few years. My principal and our staff are committed to exploring and investigating best practices in the classroom. My friend Sean Ziebarth is our instructional rounds leader. He created the website Steal Like a Teacher (homage to Sean Junkins and Austin Kleon for being the fathers of the idea) to facilitate our Rounds process. On Monday teachers and admin from various schools in our district (including our District Director of Curriculum) were going to attend a half-day training on Instructional Rounds in our Library. Sean asked if they could stop by my room for an observation. Three groups of five to six teachers would be entering my room every fifteen minutes to objectively take notes on what they saw so that they could get in post-observation groups to discuss effective strategies. I thought: what an awesome time to try something I’ve never tried before. I mean even if it fails spectacularly it will give them something to talk about. Things that are groaningly bad- not evil or mean, just poorly done. 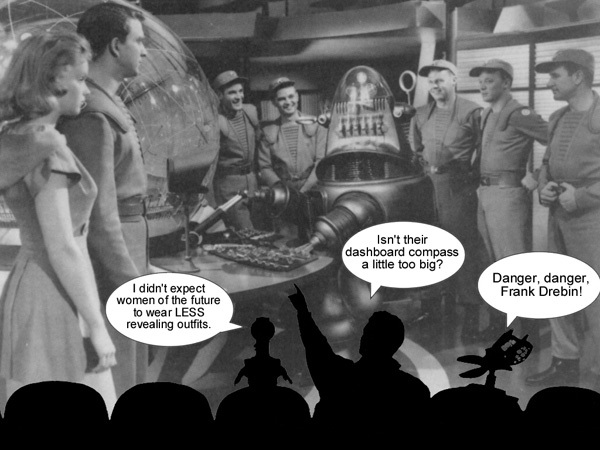 For about the past fifteen years I’ve wanted to try my hand implementing a MST3K in class. What’s MST3K? So my plan was the following. Students would find a clip from a bad film. Get together as a group. Create funny lines mocking the film. Perform the sketch, in class, in front of us and the observers. There was only one problem (well- maybe more than one) I told them about this on Monday and we were being observed the VERY NEXT DAY. So I drafted up a quick lesson plan, found some clips to show the students what MST3K is and how to apply it and then opened up my Common Core State Standards. I mean there HAS to be a standard that deals with satire and comedy right? I mean comedy is one of the sixteen Habits of Mind, it helps us survive the world. I even created a what is funny packet that we use to create a common language to analyze comedic techniques in literature and film. Well there’s not a specific standard (I guess being funny isn’t important for college and career readiness) If you stretch it, you could say that Reading Standards for Literature : 2.5 “kind of” cover comedy but Reading Standards for Information Texts say NOTHING about satire or comedy. I guess there are ZERO non-fiction writers who try and be funny. I’m not sure if I want to go to the college or work in the career that we are preparing our students for: it must be a dreary future. Well… I’ve never let a standard get in the way of a learning opportunity. In fact I’d rather let something like the results of this Student Perception Survey help guide my instructional strategies. It was hard to do it spontaneously. I actually tried to do it with another clip, but the scene above had more comedic potential than the first clip probably because there was more focus on pathos/bathos in the clip. I encouraged students to get together using a Google Doc or Google+ hangout (or just Facebook). I created an editable Google doc so they could paste their names and the link to the clip so I could preview it the night before for appropriateness. Then I did what I do best. I hoped for the best. First I created a small sign outside my door just to create some excitement. Then the students walked in and away we went. If you make fun of something in class you are usually reprimanded, but in this activity you were encouraged to make fun of stuff. If the clip was too funny it was hard to make fun of it. Bad movies or acting work best. Doing it individually or in pairs instead of in a group. Which of your comments got the biggest laugh and why? Students wrote down the answers for each and then we discussed them as a class. Often I love the reflection more than the activity. It’s important for me to model and for students to engage in reflection towards the idea of improvement. (1) They were actually in their self-chosen student blogging groups, but they confessed that they picked their blogging groups not on friendship, but rather on their ability to trust their team members to be productive. (2) Not giving them enough time was EASILY the biggest complaint. Most said they could’ve done it with two nights. 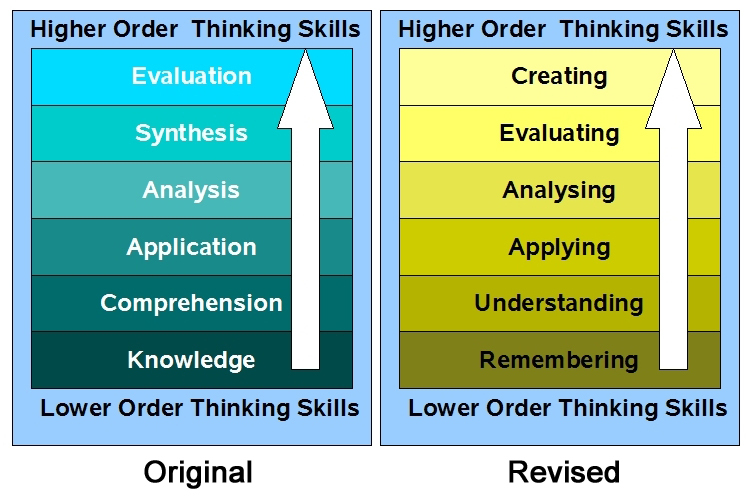 (4) Many students complained that double entrendres and working “blue” are a staple of their comedic tool kit. (5) Having students mic’d would probably be the best solution, but instead we tried moving the students to different corners of the room. This helped a bit. Perhaps moving the couch back would help. I’ve also thought of creating card-board cutouts of Joel and the crew and putting them on the couch. It’s a work in progress. Later I asked Sean what people thought about the lesson. Many were curious about how I introduced the concept and how it fit into my over-all curriculum. I was pleasantly surprised when he pointed out that in creating these Satires my students were engaged in the highest level of Bloom’s Revised Taxonomy. But it definately wasn’t my best lesson. It wasn’t even close. So why did I allow myself to be anything but the best? Why did I let other teachers watch me participate in a lesson that needed more pre-planning and more time for my students to be truly successful. It’s very had for people to imagine themselves becoming a teaching super-hero if they never see the teachers held up as “models to copy” with their costumes off. Take off the cape, take off the mask- and share your class with the world. 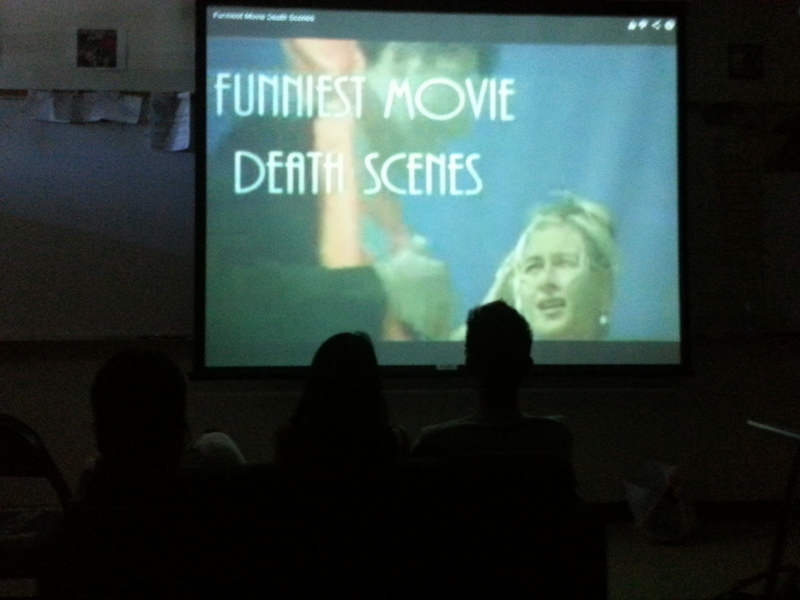 You had me at “movie sign!” I introduced a class of seniors to MST3K earlier this year. I incorporate a similar lesson in Communications, using humor as a means of getting comfortable speaking to an audience, working on spontaneity, and practicing our vocal delivery. Students are hesitant at first but nearly always want a second round. We perform live from behind the audience which helps them overcome anxiety (all eyes on the screen). I’m glad you included the comments about complex thinking skills in your reflection. Not only does that justify showing classic (awful) movie clips in class, it recognizes the value of comedy and satire as intellectual expression. From one less-than-perfect teacher, thanks for the insightful post!